It’s helped me grow in ways I can’t even describe. I joined The Pull [description later]. We practice 3 hours a day and longer on weekends. I’ve met my best friends because of it. I’ve become so much more confident in my faith, my friends, and who I am here. In Basketball, I’ve been challenged and pushed to be my best. Same in the classroom. Along the way, so many people encouraged me and pushed me. To look back to where I was a freshman, there’s been so much growth and people to help along the way. Professors constantly push us even when we’re struggling. They believe in us. They know we’re capable of doing more. Friends do that, too. People want the best for others. The faith aspect. I grew up Catholic but wasn’t close to my faith. It’s not shoved down your throat, but it’s present and I was able to grow in that area. I’ve met amazing people. It’s an interesting culture – genuine and open. The community was attractive to me; I didn’t have that at my previous college. I have coffee with the chair of department and dinner at professors’ houses all the time. That’s how invested they are. I feel 100% prepared for whatever comes next. Hope is ranked as the friendliest college in the US: “every person feels welcome, fully included, and will flourish in the way that they’re gifted by God to flourish,” said Hope’s President. On the day I visited, days after the election, there was a student-run silent demonstration in the pine grove to make a statement: No matter your background, your beliefs, your politics: you’re supported and welcome here. The basketball teams (women’s and men’s) led the nation in DIII attendance last year. I saw Jane Eyre: The Musical on opening night. Although well-supported by the community (and, I assume, parents/families), a huge part of the audience was comprised of students. Beyond that, I was highly impressed at the talent and the theater They bring in guest artists (actors and back-stage techies) to expose students to experts and benefit from their experience and talent. For this musical, the guest artist played Rochester, but all the others were students, including the musicians. The Pull, the oldest campus tradition in the US, is a massive tug-of-war across the Black River between freshmen and sophomores and coached by juniors and seniors. They dig trenches and build barricades so they can’t see the other team; the 18 pullers are helped by “cheerers” who can tell them what’s going on. Hope makes the Top 10 of “Colleges where Students are Most Satisfied with College Choice,” tying with Stanford! Students come and persist until graduation. 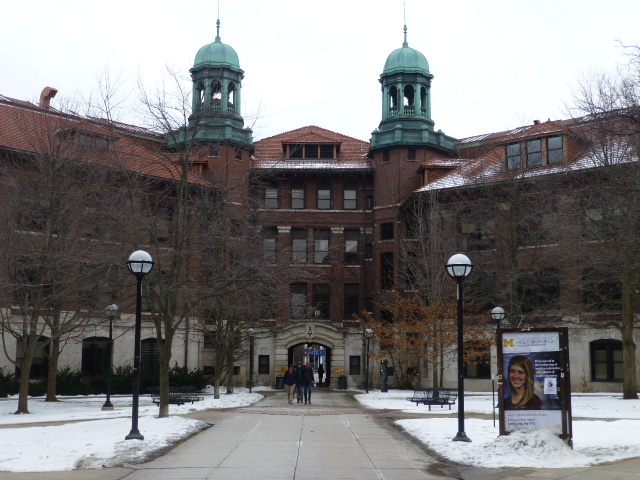 In fact, they have one of the highest in retention and graduation rates in the state, competing with UMich. The President said, “We encourage all students to explore Christianity and figure out their own faith. We don’t expect you to fit a mold, but we want you to seriously consider what it might offer you.” The two required religion classes don’t even need to be Christian based. There are “tons of opportunities to grow in your faith if you want it” such as mission trips and Bible studies. Several students on the panel mentioned that they liked the Christian aspect on campus. The town of Holland is a wonderful bike- and pedestrian-friendly community. 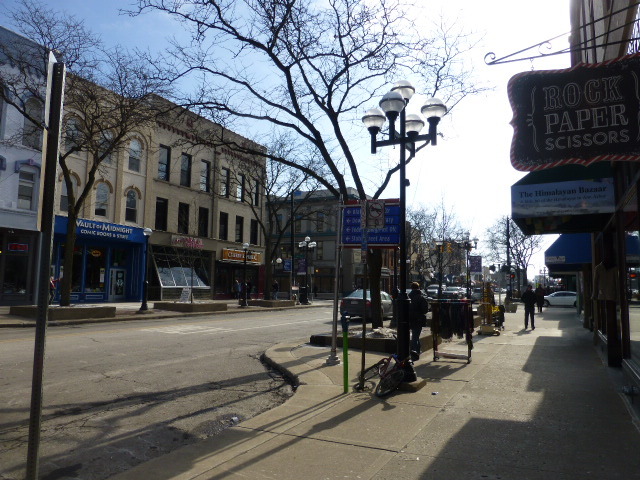 Several blocks of locally run stores and restaurants sit right off campus, and students can get some discounts in town. Hope owns about 30% of the apartments in town as housing for students (with the same expectations as dorm living such as being a “dry campus”). The white sand lakeshore beaches are a couple miles away; shuttles run there as well as to stores. The train station is 2 blocks from campus running to Chicago and Grand Rapids. Management is the biggest major (175/800 graduates this year were in the major). Nursing and Education are next in size. Engineering requires a comprehensive core before students specialize. “It’s hard to find a job that’s strictly in 1 discipline; you’re going to work with a lot of other types of engineers,” said the head of the department. “This isn’t the typical engineering department: people are engaged in other things. They’re athletes, in student government. People minor in languages, dance, etc. It’s a tight major. You have to plan carefully but it’s doable!” Seniors in the department complete a 2-semester design project from a needs statement all the way through to building the design. Hope runs an off-site center in Philly with more than 800 options for internships and experiential education. There’s a New York City internship for theater: on- and off-stage (including the business side). Summer terms allow students to spend 3-4 weeks abroad (I spoke with 3 students who did this. They studied: Spanish in Avila; Northern Ireland and Scotland: Peace and Reconciliation; and Mental Health issues in Liverpool: “I want to do international social work, so this was a great opportunity.”) Some scholarships are available. 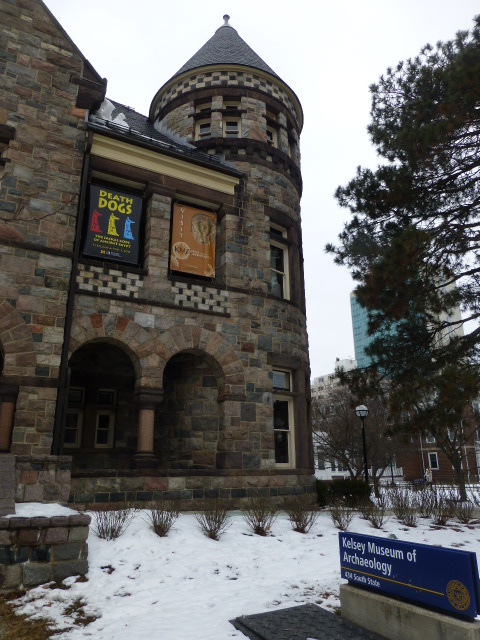 I did not get a conventional tour at Michigan because their admission office is not open on Saturday (except for a few rare dates scattered throughout the year). I’m a little shocked at this. It’s a major university; people want to visit and tour. I got the feeling from talking to their admissions office that it just didn’t matter; they assumed people would conform to whatever schedule they put forth, and really, they’re mostly right. They’ve got the name and reputation. Therefore, they clearly don’t have to try. However, this also seems to be indicative of how the university runs as a whole. They’ll give you a world class education, but you’re on your own to seek it out, meet them on their terms, and do what you need to do by yourself. Because I couldn’t rearrange my schedule in order to arrive on a weekday for a conventional tour, I reached out to a friend doing a graduate program at the university. She spent a few hours walking around with me. Although I didn’t get the “party line” and couldn’t ask the tour guide about his/her experiences, I think that I ended up getting much more than I would have on a school-based tour. We walked through much of the area surrounding campus, walked through a lot of the university buildings, had lunch at a local restaurant, and I got the uncensored impressions of the students and school from someone not working for admissions. “The classes are great, but they’re big.” She said that it’s hard to get advising sometimes, hard to make sure you’re taking the classes you need, hard to get access to some classes. She’s a TA and knows that a lot of the undergrads’ educations were coming from people like her. I asked her what she thought of the university in relation to Berkeley where she did her undergraduate work. “They’re a lot alike. You need the sharp elbows here, too.” However, she said that the students are very different at Michigan. 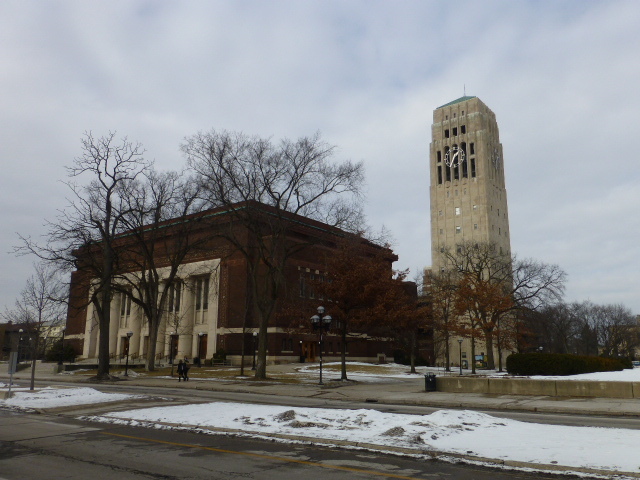 “Maybe I’m jaded after Berkeley, but Michigan is supposed to be this bastion of liberalism. It just isn’t.” She described the overall student body as “rich and conforming.” There are a lot of girls with the stick-straight hair and the “right clothes and right bags.” That’s not to say that there’s not diversity. Clearly there is. It’s a huge school (about 28,000 undergrads); you’ll find some of everyone here. However, there seems to be an overarching culture of conformity. The students I saw as I walked around campus backed up that assessment. 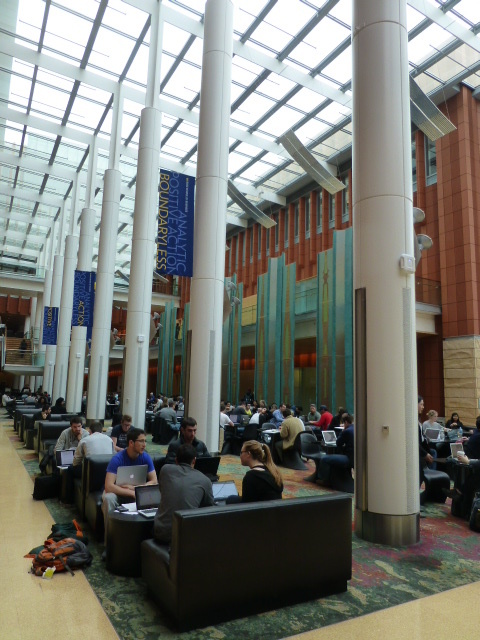 As we walked through the library and then the union, students packed every available space and were studying. There was some socialization going on, but very little. 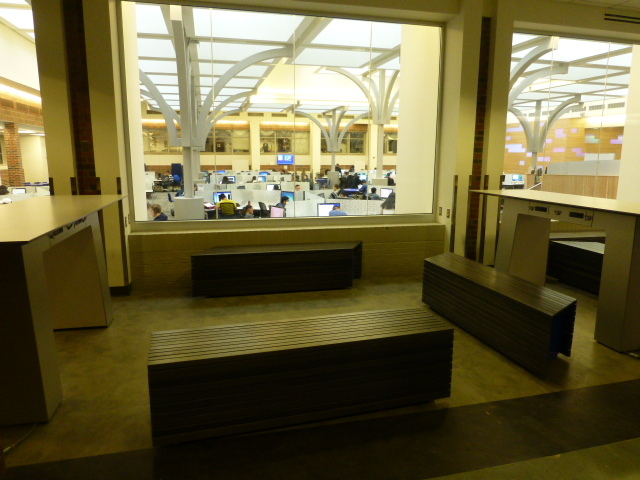 Books were open, papers were being written, areas were relatively quiet. It’s the sort of scene I would have expected more on a Sunday afternoon than on a Saturday. Students here clearly take their learning seriously. 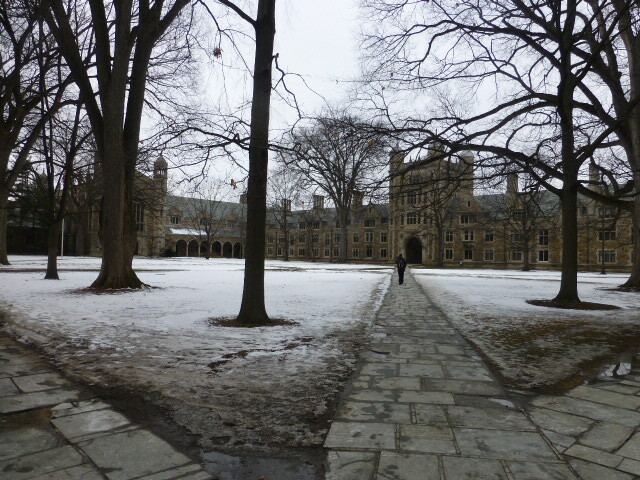 However, there were also a lot of students out on the “Diag” (diagonal path cutting across the quad) and heading in and out of buildings. 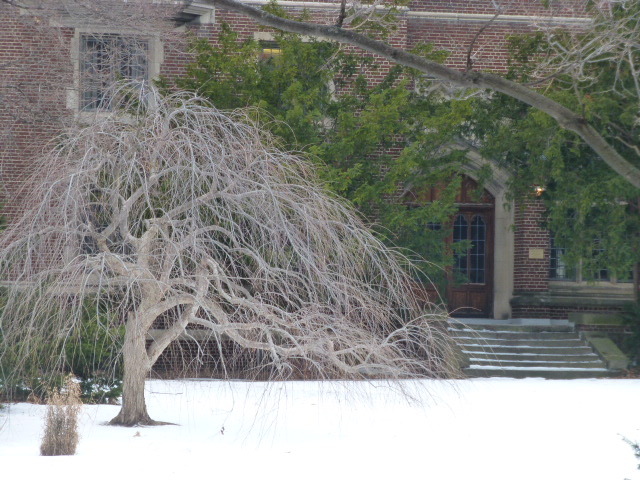 Even on a cold, dreary day, there was plenty going on around campus. The blocks surrounding campus are clearly geared towards meeting students’ needs. There’s a vague sense of “counterculture” but most of the stores were typical college-student places: cafes, restaurants, book stores. There’s no shortage of things to do on or around campus. 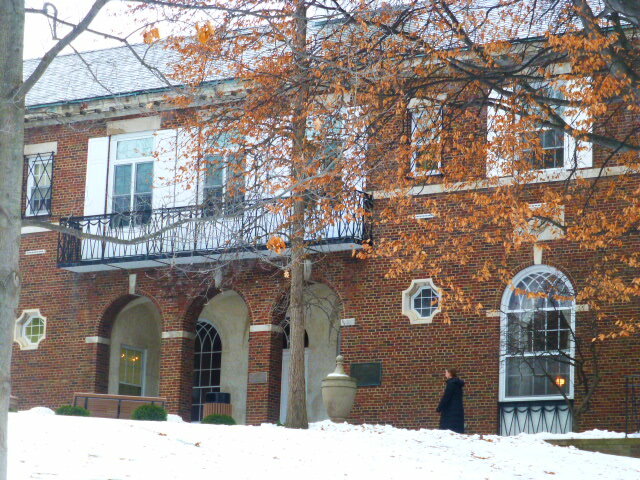 Most students study in the Liberal Arts College (LSA: Literature, Science, and the Arts). Freshmen can also apply to Architecture, Engineering, Performing Arts, Kinesiology, and Nursing. 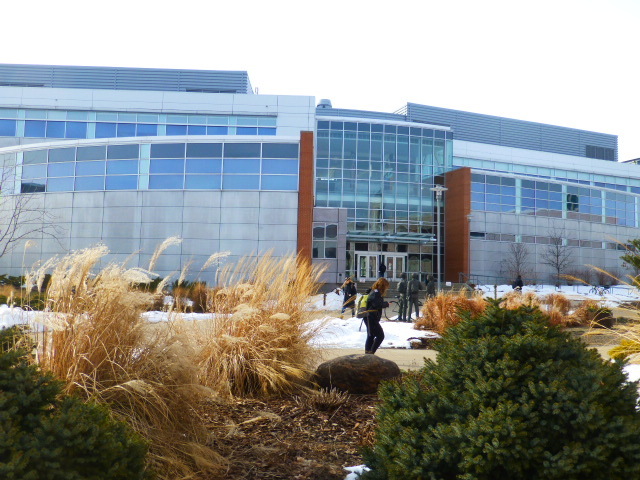 Students interested in Education, Business, Social Work, Pharmacy, Public Policy, and some other programs must apply and be accepted into the program during freshman or sophomore years (although some give Freshman Preferred Admissions, aka guaranteed placement, when they’re accepted to the university). Unusual majors include: Arabic, Armenian, Persian, Turkish, and Islamic Studies; Interarts Performance; Microbiology; Naval Architecture and Marine Engineering; and Screen Arts and Culture. I had high hopes for Adrian; I had heard the name and knew the basics so I was curious to find out more. I was a little concerned about the retention rate; unfortunately my visit didn’t entirely alleviate my fears in that realm. However, I really liked the students I spoke to, the people in the admission office, and the campus. Athletes, B to B+ students, and students who will get involved and who want small classes will thrive at Adrian. My tour guide was surprised at how much he loved Adrian. “I really had wanted to go to Notre Dame but didn’t get in. I got into Michigan, had put down my deposit, had a roommate picked out – but then came back here to visit. I changed my mind that day and deposited.” His parents both went to Adrian and were thrilled that he chose to go – and he got a legacy scholarship which helps! People he knows who have left did so for a variety of reasons: some wanted to be closer to home, one joined the army, some thought college wasn’t for them. A lot of football players were recruited from Florida and hated the winters in Michigan. 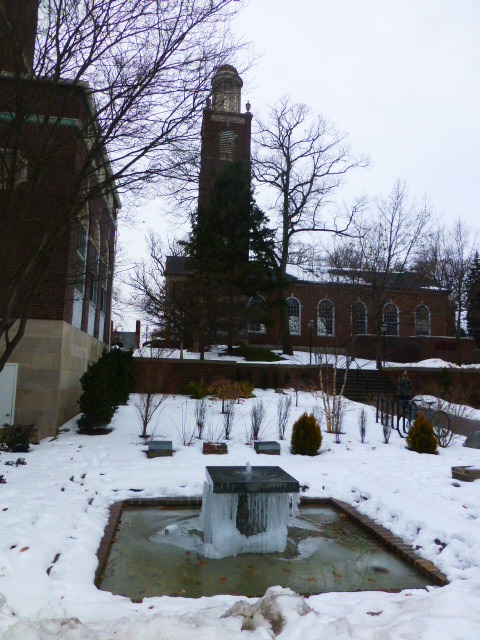 The campus is nice, even in the middle of winter. Every year, they hold a Creativity Awards contest. The winner gets $10,000 to improve campus. So far winners included a large mural outside the student center, bike racks/bike share, International Walkway with things written in multiple languages, etc. “During the year, there’s something like 1000 flower baskets,” said the tour guide. “I wish you could see it then. 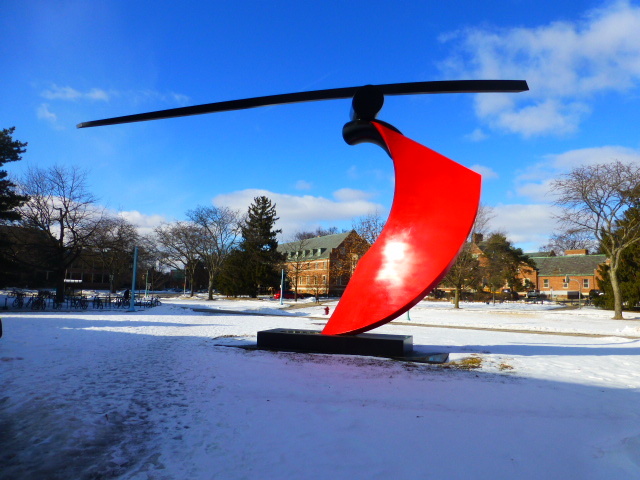 All the art on campus is student-created. 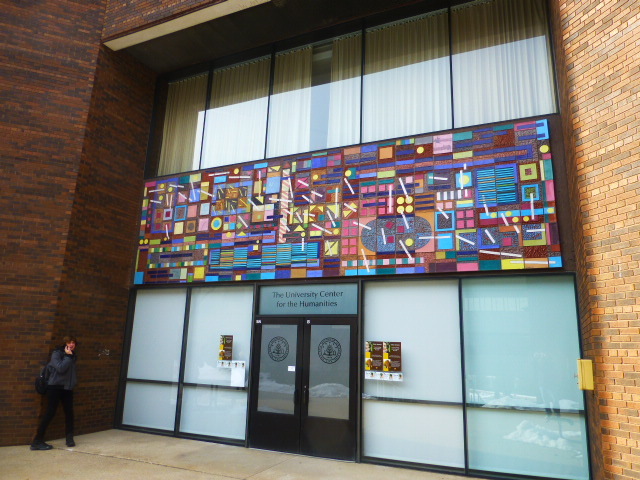 They have an extensive art program with a dance studio, photo labs, pre-architecture, and Interior Design. 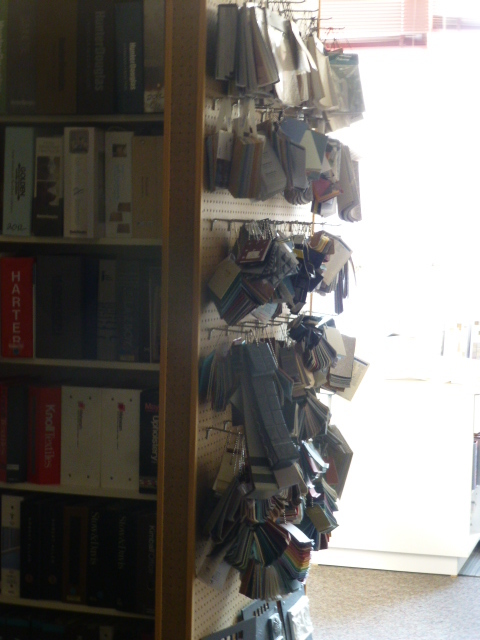 One studio has 90 styles of lighting for the architecture students! 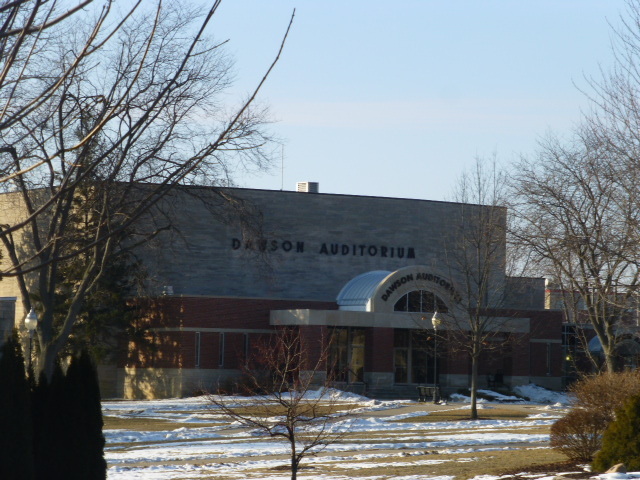 Music is also big here, and the city of Adrian has a symphony that uses the college’s theater. 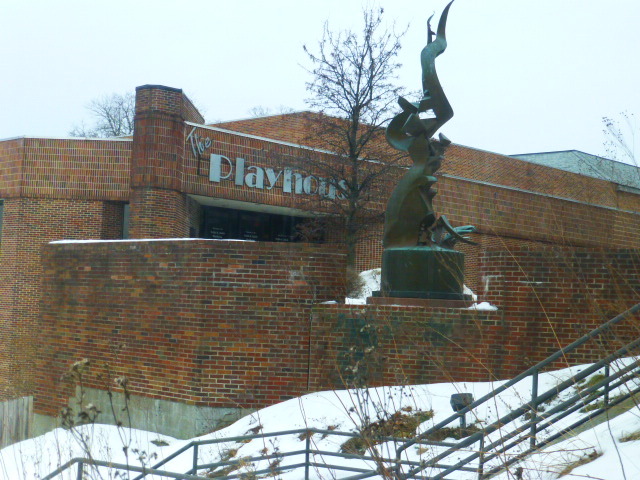 The oldest building on campus, once a stop on the Underground Railroad, is a three-story stone building now used as the theatre. They do a great job refurbishing buildings for updated purposes. The student center is the old gym. They spectator boxes are now study boxes that are open 24/7. The Salon in the basement advertises “nails, hair, and tanning.” The Starbucks in the first floor takes flex bucks. Almost 2/3 of the students are athletes and there’s a lot of support for the teams. There was a cheer competition in the gym as we went through around 10am on a Saturday. Several girls had pulled exercise bikes over outside the glass doors to watch as they worked out. Adrian’s hockey rink is the only one in the area, so community teams use it as well. A Community Team was using it that morning. 200 Adrian students play hockey on one of 6 teams (4 men, 2 women). They have DI club teams for both men and women; varsity is DIII. They also have synchronized skating and figure skating. Hope is the big rival. They’re quadrupling the size of the weight room (it’s currently tiny). The tour guide’s largest class was 30 in his Intro to Sociology class. Smallest were 6 (Freshman Writing) and 3 (upper level Econ). “They’re getting rid of the Econ major, so I’m taking a lot of upper level classes and individucal studies so I can finish before they phase it out.” He took Kitchen Chemistry – they did a lot of baking to experiment with how different things influenced the outcome; they ate an fruit that blocked most taste receptors and ate different foods before and after to test this; worked with yeast, etc. He loved his Movies and Culture class in which they discussed social aspects of films starting back in the 30s. This started as a Methodist school but is now loosely affiliated at best. 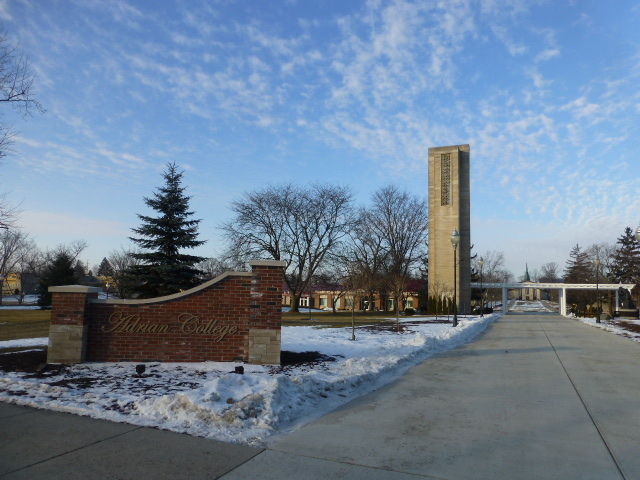 My tour guide was a Methodist and will go downtown to services; Catholic students often go over to Siena Heights University which is a few miles down the road. There’s a non-denominational service on Wednesdays in which a religion student will give the sermon. Students can bring lunch to chapel. The music wing: offices and practice rooms. Their Accounting and Business program is strong with 11 concentrations to choose from including Event & Facilities Management, Health Care Management, Sports Management, and Fashion Merchandising. The Director of Entrepreneurship brought Dominos and Little Ceasars pizza to Israel before he started to teach. Criminal Justice, Social Work, and Art History are also worth noting. The college offers several Internal Masters (open only to Adrian students). Several students will use the Athletic Training and Industrial Chemistry Masters as a gateway to Med School. 98% of students get placed in med schools or in to the health field upon graduation. 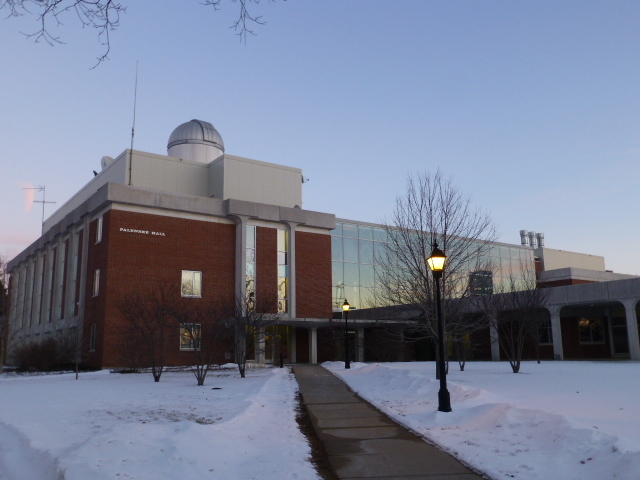 I didn’t get a formal tour of Albion, but talked to an admissions rep for about 45 minutes before walking around campus on my own during the chilly dusk of a Friday evening. 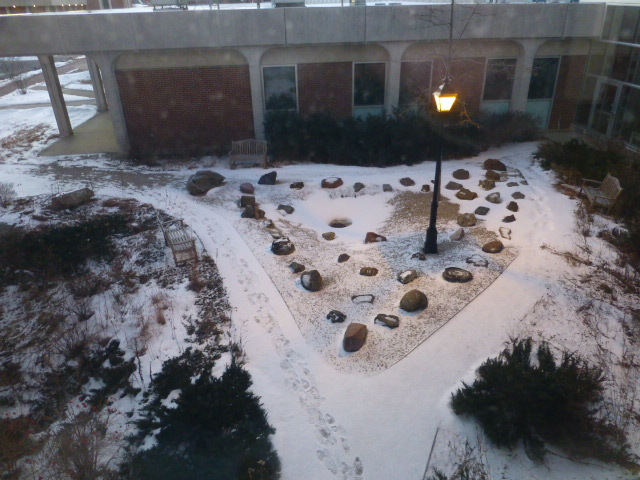 The campus was quiet, not surprising given the weather and time. 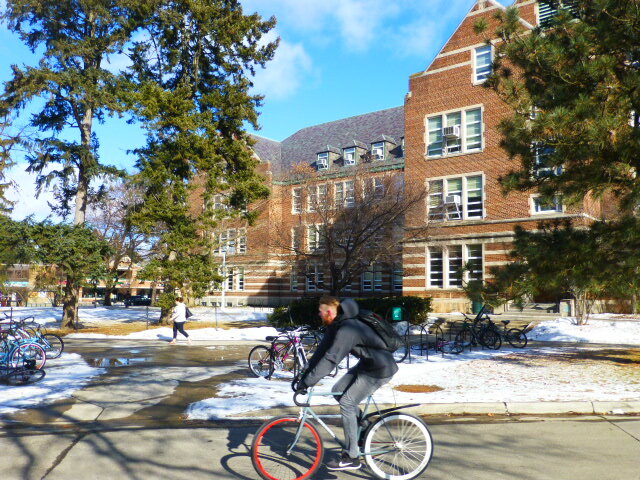 Classes were done for the day and students weren’t heading to dinner or out to events yet. However, I talked to the students working at the student center and in the library and ended up getting a lot of interesting information from them. Solid students who want a small campus, small classes, interesting classmates, and a chance to get involved will do well here. There’s nothing going on in town (the population is less than 10,000 people). “There’s a good taco joint and a good bar. The movie theatre is free for students. Otherwise . . . not so much.” Jackson, a larger town, is 15 minutes away and the college runs shuttles to Ann Arbor and to the airports. There’s a train station in town that will take them to Chicago. Freshmen can have cars on campus, but a lot of people don’t bother leaving campus because so much is offered. They even have a convenience store. 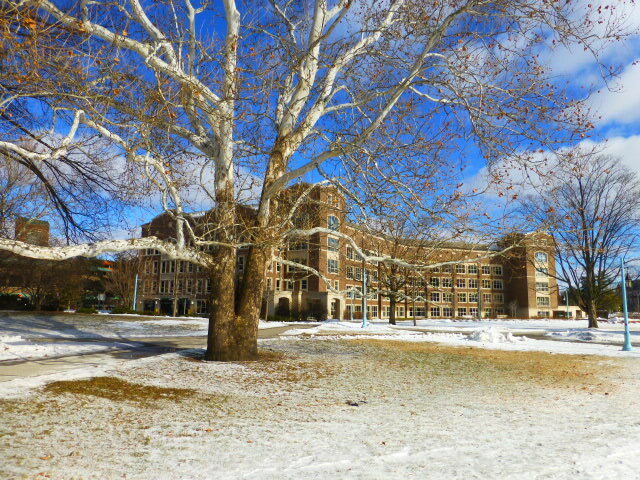 All first year students live in Wesley Hall, a traditional-style dorm that holds 550 students. There are other options for older students including frat houses and two apartment-style complexes. Students are not stuck in traditional dorms for 4 years. Wifi on campus “can be spotty.” The food gets mixed reviews ranging from “great” to me getting a blank stare before being told that the new food vendor, while it has helped some, “doesn’t really make things that college students tend to want.” The other student said it was “ok but not spectacular.” Frat houses have their own food arrangements such as a cook so that helps. Greek life is huge with about 2/3 of the students affiliating with a group. “It’s not like the big schools, though. We all hang out together.” He’s in both the Panhellenic and Intra-frat councils. Albion still has a very loose religious affiliation but it’s not really all that noticeable. Students do have to take one theology or philosophy class as part of their distribution requirements, but there are plenty of options and no one is pushing an agenda or belief system. 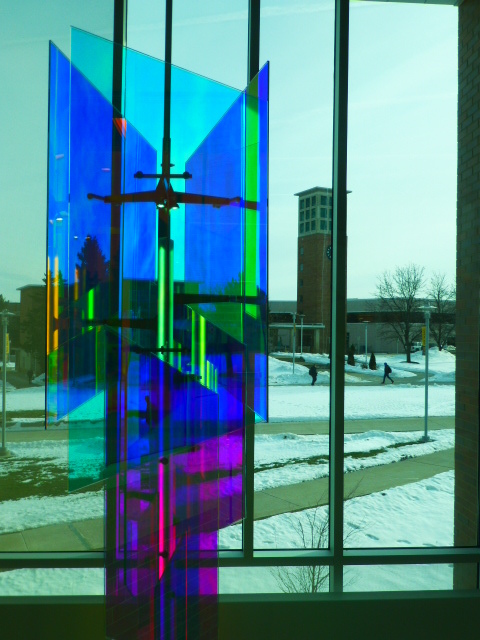 Catholicism has the largest number of self-reporting students, and Hillel is one of the more active groups on campus. Teaching is automatic entry once students declare the major. Others require a short essay. Honors classes are not just harder; they’re more discussion based. Teachers actually bid on the classes. Students take 1 honors class per term and have to write a Thesis. It gets published and is assigned an ID number so they are officially published and can put it on a resume. This COD is becoming more competitive to get into. Health Care: this is a 4-year guided program for students interested in any aspect of health care, including vet. This is also becoming more competitive. Pre-med is a large major; 92% go onto med school. One student said that the relationships with the professors were the best thing about the college. The largest classes (like Bio or Chem 101) can have upwards of 50-70 students. One student said that he tended to have 35-40 in his first year accounting classes but most have around 20. Sciences tend to be very strong, especially Neuroscience, Environmental Sciences, Geological Sciences, Pre-Engineering, and Sustainability Studies. Professors come to teach here from the larger universities; they say that the science equipment rivals anything the big schools have. Other noteworthy majors include Law, Justice, and Society; Economics and Management; and Ethnic Studies. Job placements trump a lot of other places. 94% of graduates are in full-time work or post-grad upon graduation – and that’s tracking over 16 years! The alumni network is strong both internships as well as post-graduation job placement. Students are encouraged to do research in a variety of areas, not just the sciences. “One of my friends is working on a project about how hip-hop is reviving Detroit.” During the students’ time on campus, Albion also provides an excellent academic support system and have been highly ranked for their support of students on the spectrum. Applying to the university is free; they’re a Common App exclusive school. They will superscore both the SAT and ACT. They offer a $5,000 scholarship for students who don’t live in MI, OH, or IL; this is stackable with other merit scholarships that a student qualifies for. All scholarships are automatic consideration except the Distinguished Scholars program. Students who qualify for this competition get invited to campus and will receive $1,000 just for attending. DS awards range from $15,000-$23,500. 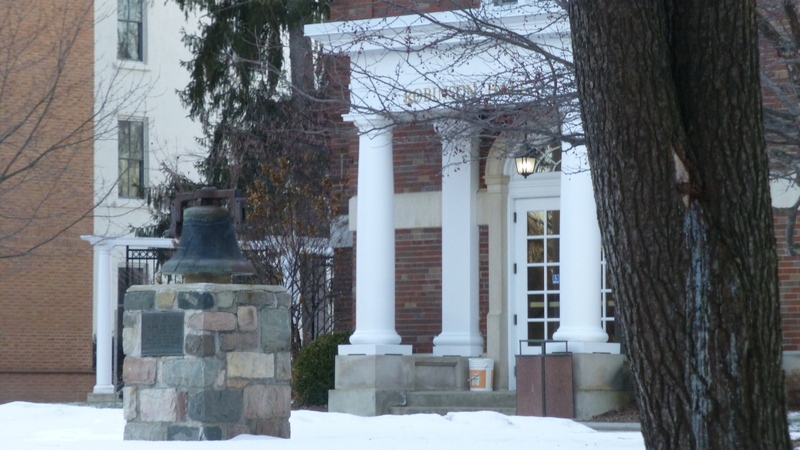 For most students at Albion, the final cost of attendance averages only a few thousand more than UM or MSU. 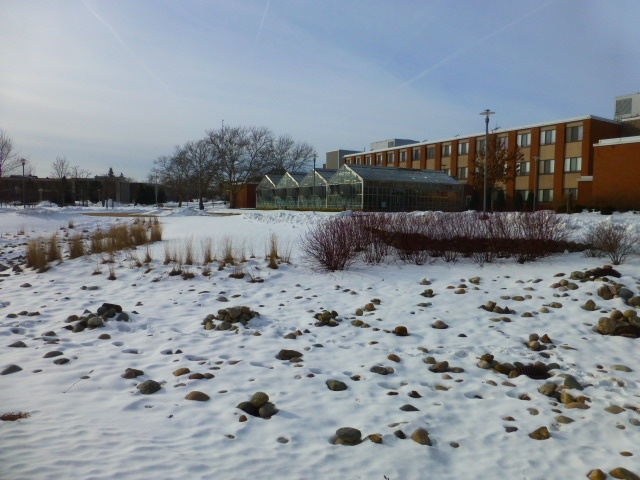 They have a Nature Center on campus and a River running through the south end. There are wetlands where students can do research. A student farm grows mostly vegetables; it doesn’t produce a lot, but the dining hall will use what they do grow. Students also conduct soil testing and other research there. Students interested can also live in the Environmental House, a 2-minute walk from campus. There is also a large equestrian center owned by Albion. Kalamazoo has it figured out. 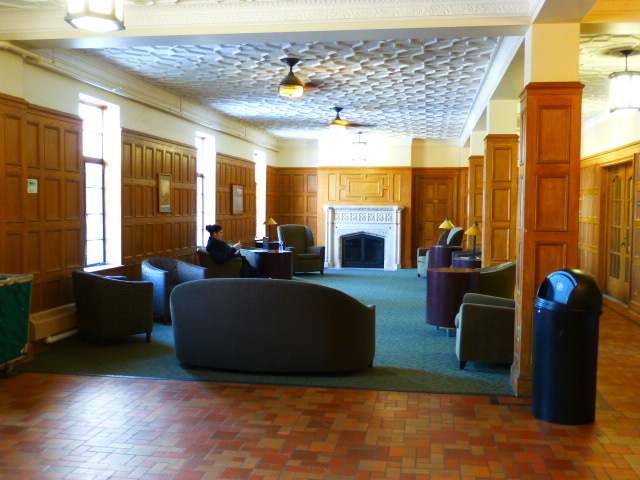 There are a lot of good, selective liberal arts schools out there; to get students – especially those from a distance – to view it as a serious choice, they need something that makes them stand out. K (as it’s called) does, and its 92-93% retention rate tells you that they’re doing it right. Their “K-Plan” provides depth and breadth in academics, experiential learning, international engagement, and a senior individualized project (SIP). The Flexible Curriculum enables students to take ownership and pursue interests. Only half of their coursework is “dictated.” 32% is in their major, 8% each in foreign language (into the intermediate level) and Shared Passages Seminars (3 interdisciplinary classes taken in freshman, sophomore, and senior years), and “5 small units” in PE/Wellness. The other 50% of their time is open explore other areas of interests, double major, have a couple minors, do more internships, etc. Classes sizes run from single digits usually about the mid-30s although a couple will have 99 students in the biggest lecture hall on campus. “These are abnormally large classes with abnormally large science majors.” Some of the favorite classes of students we talked to included The Empire Writes Back (exploring the relationship between Imperialism and Empire), Graphic Novels, and Music and Identity. Internships: These only happen in the summer and are offered all over the world. Any student returning to K the next year can do one. A couple specific placements that students mentioned were at Be the Match and Gay Rights Advocacy in the Presbyterian Church. Field Experience: These add structure to the internship. They must be at least 6 weeks long, at least 32 hours a week. Students write structured reflections, a learning outcomes contract, etc. Discovery externships: These are like mini, 1-4 week internships with a crucial difference: significant contact with alumni. Students often live with the alum, adding “porch time,” aka morning and evening time to talk about life since K. Our tour guide did one in a non-profit. She had just taken accounting so it helped to see the financials. Center for Civic Engagement: They work with professors to create classes with a service-learning component such as Psychology of Law (focuses on an alternative to juvenile detention) and Feminist Psychology (works with Planned Parenthood for reproductive justice). Each program requires at least 3 reflections. Arcus Center for Social Justice Leadership: This supports the pursuit of human rights and social justice by developing emerging leaders and sustaining existing leaders in areas such as human rights, economic justice, educational equity, politics and justice, race and racism, immigration, genders and sexualities, mass incarceration, health equity, etc. National Relationships with the Constitution – is it a healthy one? This is primarily a residential campus, and it shows in the engagement on campus. 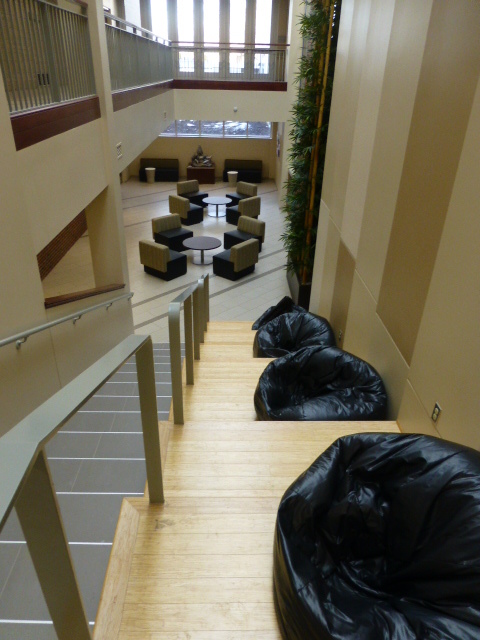 There are 2 freshman-only dorms with large lounges that feel like a home. There are tables, rocking chairs, a piano, couches, fireplaces. Rooms are all different sizes because these are older buildings. Freshmen must attend 5 First Year Forums (on topics like intercultural communication, personal decision making, etc) as part of their First Year Seminar class. 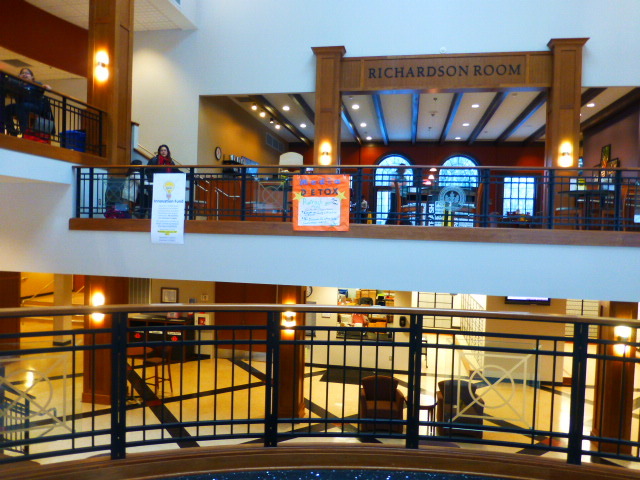 The student center is accessible 24/7 with their ID and really is the center of much of the campus activity. There are no separate “centers” (multicultural, women, etc). The culture here is that they’re all in this together: they don’t want to divide but bring together and educate. The work is done by everyone, not just coming out of one office. There is plenty of support for all students on campus. 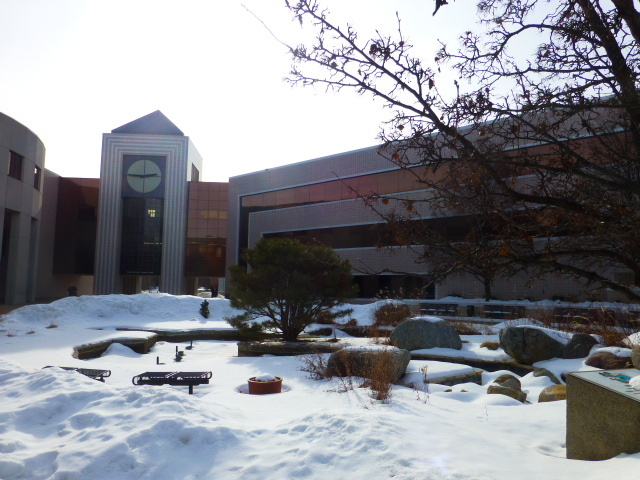 The health and counseling centers are inside the union so they don’t have to trek to another building. “It actually is nice for privacy although that seems counterintuitive. 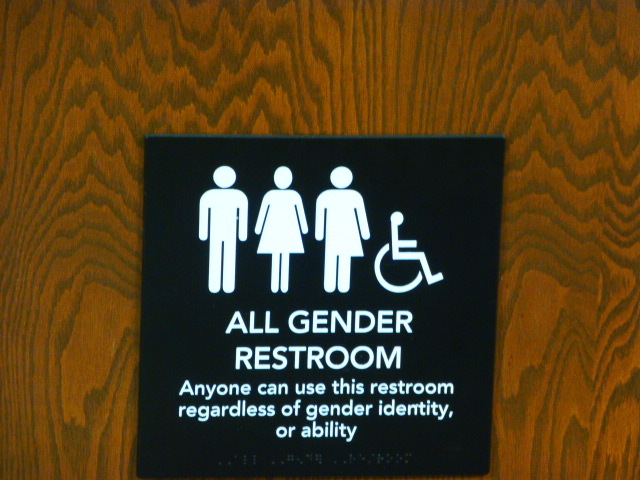 People don’t see you going into another building.” There are also student-run centers and support groups such as S3A (Student led conseling about sexuality) and Kaleidoscope (LGBTQ). Students are highly engaged in clubs and other extra curriculars. Music and theater are open to everyone (Band and Orchestra carry partial credit) and there’s a student run dance team. If students run out of things to do on campus (which is difficult to do), the city of Kalamazoo (pop. Of about 250,000 people) offers quite a bit. 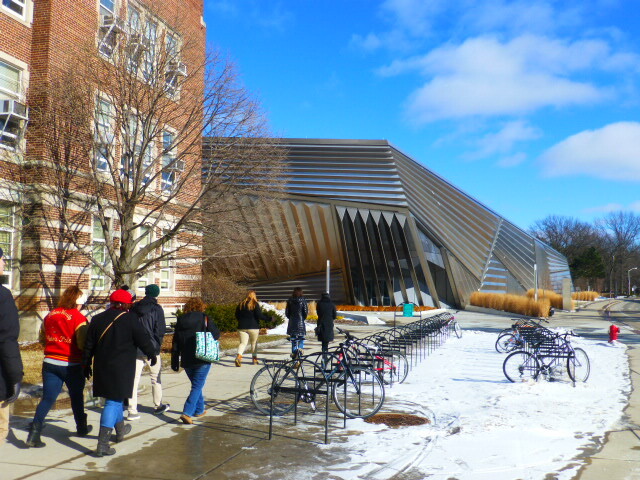 Western Michigan University is right across the street and although they don’t mix much, there are some opportunities to take advantage of the much larger school. For examples, skaters can go over to Western Michigan and participate on their teams. Day Of Gracious Living (DOGL): classes are cancelled and they go to the beach. Streaking the Quad – celebratory. Monte Carlo – fancy dress-up night. The Common Books series is well developed and well-received by the students. Chosen books are recent and engaging with a relevant theme. Authors come to campus to give a reading and participate in a colloquium Q&A session. Small group discussion is done in First-Year seminars. Recent books include: In the Shadow of the Banyon, We Need New Names, The Good Soldiers, Once Upon a River, Fever, Purple Hibiscus, Brief Wonderful Life of Oscar Wao, and Empathy Exams. It made me more aware and more confident. It gave me the education and capacity to act. It made me realize I wanted to give to the community. I was the shy guy but now I have a boost of confidence. I’ve met people I never would have talked to in HS, and see them as friends. It opened my mind to talking to everyone. They all have incredible stories. At K, social justice is right up front, even in Sciences. I realize how much I’ve learned here about microaggressions, what privileges I have, being conscious of what I have, etc. I have a whole new perspective. To be unabashedly excited about whatever I want – there will always be someone just as excited! I can be loud about what I’m into – or not into – and people won’t bash me for that. It gave me an awareness of myself, of who I share space with, of occupying the space in the world. 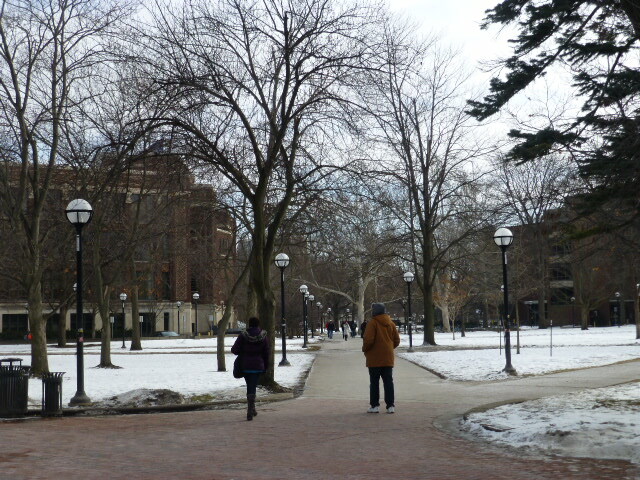 Although there’s a lot of traffic around this 2-mile x 2-mile campus, the middle of MSU is lovely and feels cohesive. They boast about their 10,000 feet of sidewalk (portions of which are heated). 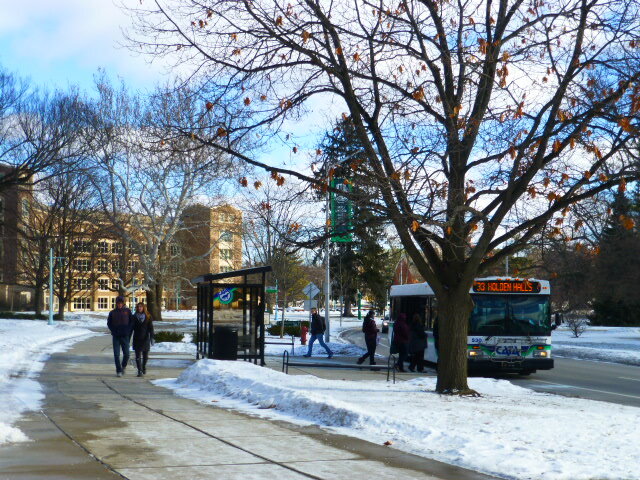 “Walking from place to place is a good call-home time!” said one guide, but if they don’t feel like walking, there are plenty of buses circulating around campus and through town. A bus pass costs $50 a semester or 80c a ride. 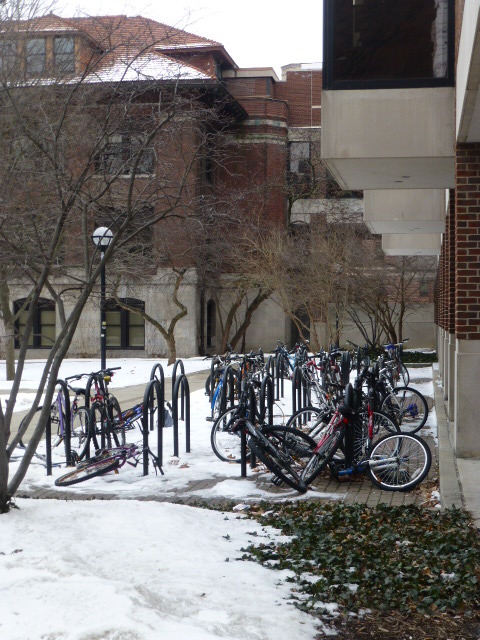 Freshmen cannot have cars “which is just as well – parking is located a 15-minute walk away. You aren’t using cars for quick trips anywhere.” Both guides agreed that cars just weren’t necessary. Even getting to the Detroit airport is easy: the university runs shuttles there at breaks. The tour guides (a junior from Denver and a freshman from Philly) were some of the best I’ve had. They both came from small high schools and were looking for the larger, Big-10, rah-rah sort of school. They clearly loved MSU and used personal anecdotes to illustrate what life was like for them rather than spouting statistics or generalities. I walked away with a good sense of who would thrive here: smart, independent students who are willing to ask questions (not just in class) and get involved in something; it seems like students here have found a really good balance between the academic and the extra-curricular. Although campus can seem overwhelming, the guides said that participating in Orientation was key in figuring out how to get around but it’s also on them to make the effort; someone suggested to them that they “walk their schedule” before classes to really learn where they were going. One guide didn’t do that and panicked the first morning – but was able to pick up a map and get directions from the service desk in the res hall. All freshmen are required to live on campus; the dorms are attractive and comfortable. 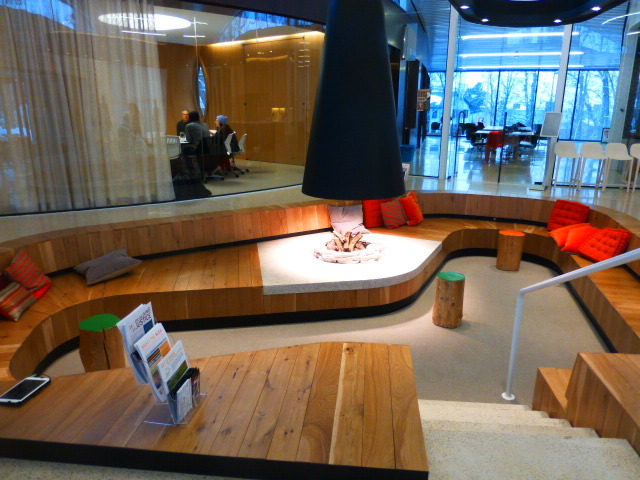 The only complaint is that many rooms don’t have wifi yet (but all common areas have it). They are working on this. Currently, students can request which “Neighborhood” or dorm they want; next year, they’ll be able to pick their exact room. 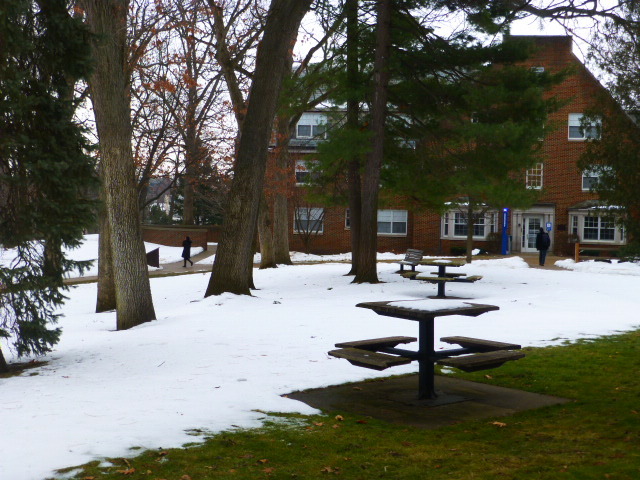 Each neighborhood has at least one dining hall for a total of 10 around campus. They’re open at different hours (some opens at 7am, some are open until midnight, etc). 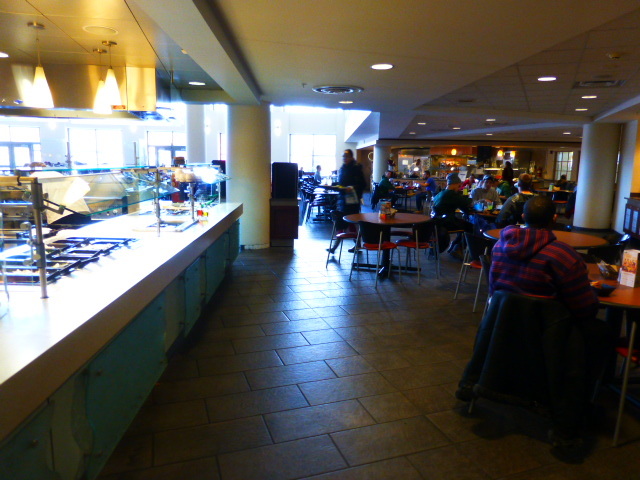 Students get unlimited swipes so they can grab a coffee or snack between classes. There are also grab-and-go places, coffee shops, etc on campus; many fast-food places directly off campus; and a food truck comes on campus (which only serves food sourced from within 2 miles of campus!). There’s also a bakery in town that provides baked goods to the dining halls. 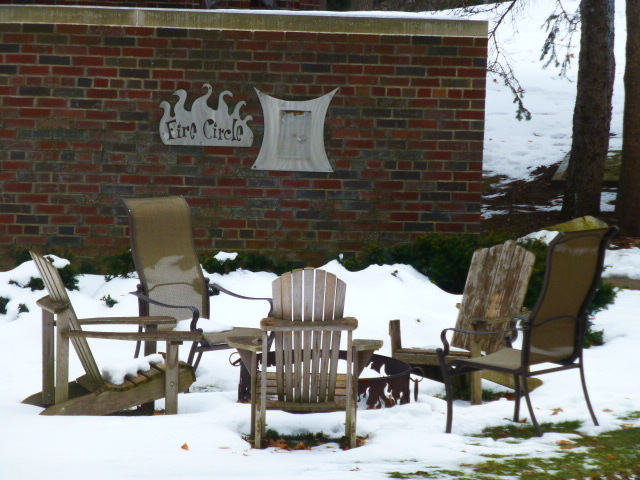 It’s hard to get bored on campus with 650 clubs available (which includes Greek life and a Squirrel Watching club). Sports are popular, of course. Students do have to pay for tickets to men’s hockey, basketball, and football games, but all other sports are free. 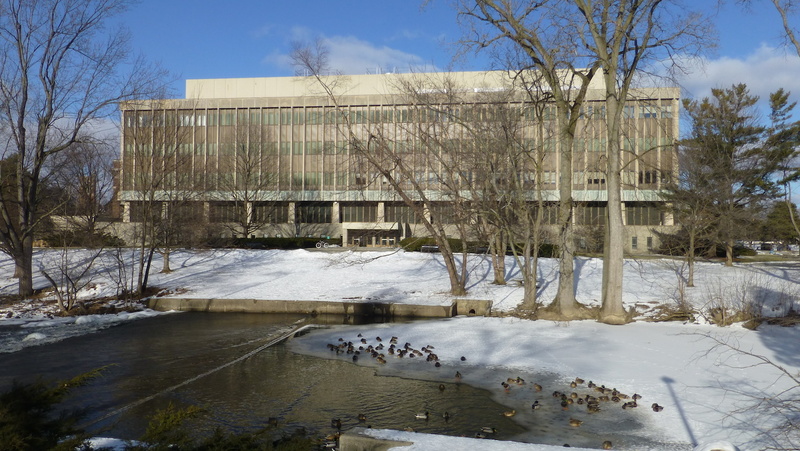 The Red Cedar River, which cuts the campus in half, also provides recreation: students play hockey on it in the winter and can raft down it in the summer. 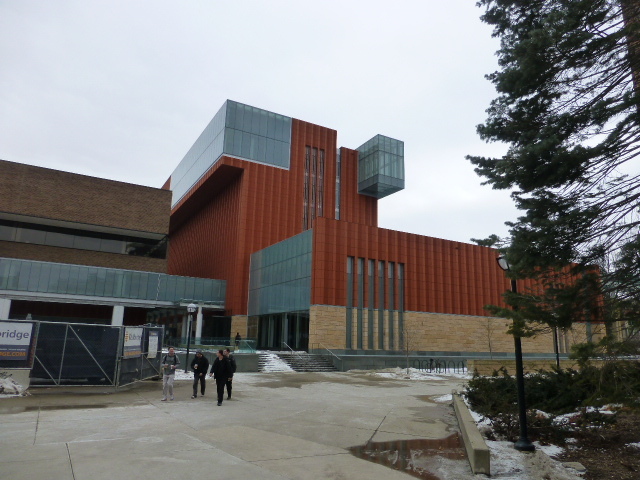 They have an excellent museum designed by a world-class architect. They movie Batman vs. Robin was filmed here; the students are really excited about seeing the final product after seeing the filming! Students can take traditional, online, and “hybrid” classes (usually 1 class a week in a lecture hall and the discussions and homework online). One of the guides took a 600-person hybrid business class; her microeconomics class was also huge. However, they also had classes of 17 (writing) and 8 (hospitality/cooking class). Their “Engagement Centers” (there are several around campus) provide tutoring, writing centers, and more for students needing extra help with academics. 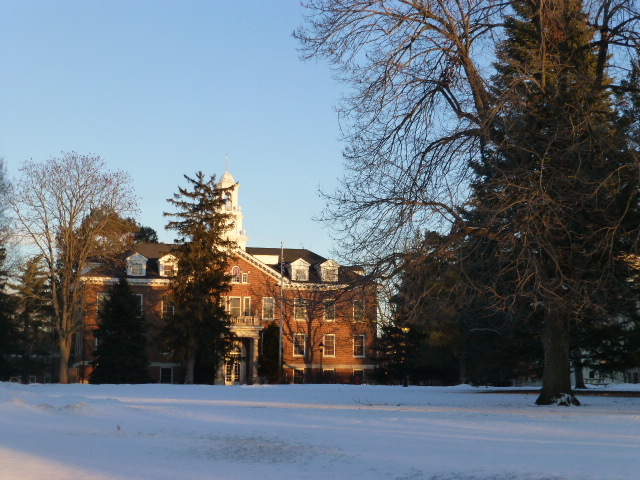 MSU began as Michigan’s land-grant institution; not surprisingly, the agricultural programs got mentioned several times, and the Agricultural College is popular and strong. Notable majors include: Fisheries and Wildlife; Construction Management; Landscape Architecture; Sustainable Parks, Recreation, and Tourism; and Entomology. 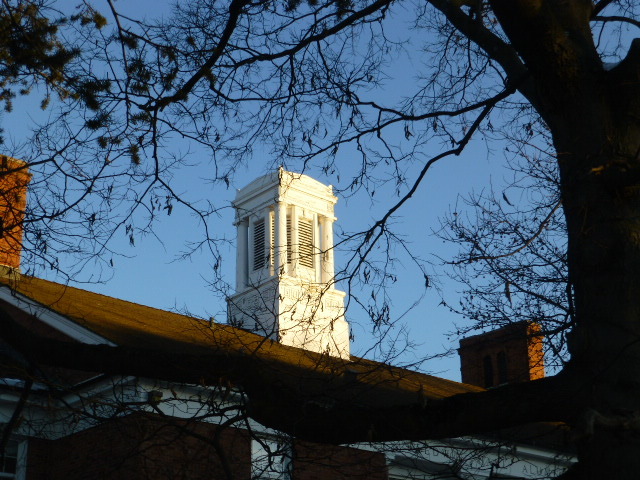 The James Madison College offers 4 interesting majors including Comparative Cultures and Politics, Social Relations and Policy, and Political Theory and Constitutional Democracy.